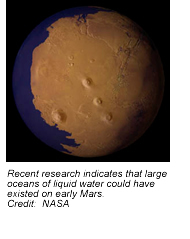 NASA-funded astrobiologists at the University of California, Berkeley, have discovered evidence supporting the presence of large oceans of liquid water on early Mars. One of the most obvious surface features on Mars is a large plain surrounding the north pole that resembles a sediment-filled ocean basin with shoreline-like features. But the purported shoreline isn’t level, an observation that has been used as an argument against the presence of an ocean. This new study shows that the undulations can be explained by movement of Mars’ spin axis, and thus its poles, and that a liquid water ocean could indeed have existed there.The scientists’ research was published in the June 14 issue of Nature. “This work strongly supports the idea that there were large standing bodies of water on the martian surface,” said Carl Pilcher, director of the NASA Astrobiology Institute at NASA Ames Research Center, which co-funded the study. “Interpreting this topography as an ancient northern ocean could have a great impact on current and future Mars exploration,” he added. “When the spin axis moves relative to the surface, the surface deforms, and that is recorded in the shoreline,” said study co-author Michael Manga, a professor of Earth and planetary science at UC Berkeley, and member of the NASA Astrobiology Institute Team there. “On planets like Mars and Earth that have an outer shell or lithosphere that behaves elastically, the solid surface will deform differently than the sea surface, distorting the topography,” added primary author Taylor Perron, a former UC Berkeley graduate student, now a postdoctoral fellow in Harvard University’s Department of Earth and Planetary Sciences. Perron’s calculations show that the resistance of the elastic crust could create elevation variations for topographic features like the shoreline, in accord with observations. Perron, Manga, and their colleagues calculate that on Mars, an initial shift of 50° from today’s pole would be sufficient to disrupt the shoreline. Manga theorizes that the shift that precipitated the tilt of Mars’ rotation axis is related to the presence (and great mass) of an ocean at one of the poles. If a flood of water had filled an ocean at the northern pole on Mars about 3 billion years ago, its mass might have been enough to shift the pole 50° to the south. Once the water disappeared, the pole could have shifted back. Manga also said the source of the water, while unknown, may have produced a flood or deluge greater than any that have been observed on Earth, evidenced by huge canyons in the flanks of the Tharsis rise, site of the solar system’s largest volcano.The water may have evaporated, but it may also have sunk back into underground dikes, frozen near the surface but possibly liquid below. Additional coauthors of the study include Mark Richards, professor of Earth and planetary science and dean of physical sciences at UC Berkeley, Jerry Mitrovica from the Department of Physics at the University of Toronto in Ontario, Canada, and Isamu Matsuyama from the Department of Terrestrial Magnetism at the Carnegie Institution of Washington. The work is part of UC Berkeley’s BioMars project. The research also was supported by UC Berkeley's Miller Institute for Basic Research in Science, the Natural Sciences and Engineering Research Council of Canada, and the NASA Mars Data Analysis Program. The NASA Astrobiology Institute (NAI), founded in 1997, is a partnership between NASA, 16 major U.S. teams, and six international consortia. NAI's goal is to promote, conduct and lead integrated multidisciplinary astrobiology research and to train a new generation of astrobiology researchers.